Google will be glad to give you directions to Few’s Ford Access Area. 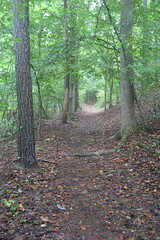 The Holden’s Mill Trail is one of two trails available from the Buckquarter Creek Trail. The trail entrance is obvious with marked signs and a bridge crossing the Buckquarter Creek. The Holden’s Mill Trail is actually two loops connected by a short common path. 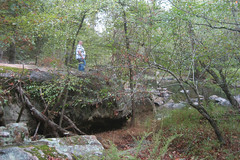 The large loop contains most of the distance while the small loop around the ruins of Holden’s Mill is the climax of the hike. 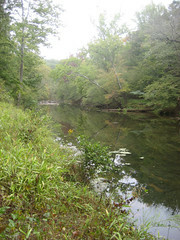 The riverside portions of the loops are typical of most Eno hikes. Rapids and rock-hops are common and beautiful. During our hike the water was very low and very clear. 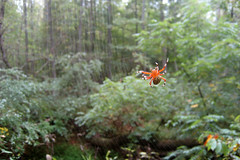 The higher ridge portion of the large loop contains a moderate climb of 200-300 feet through hardwoods. 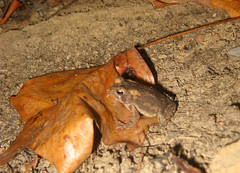 The leaves were just beginnning to change for autumn. 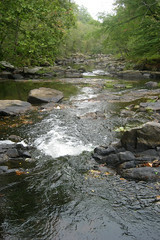 Mid way through the large loop, a small creek is crossed to join the smaller loop around Holden’s Mill. 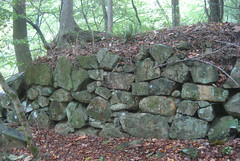 Several rows of stacked rock suggests that a mighty structure once lived here. Rock remants of the dam are visible on both sides of the river. Certain times of the years, planted flowers are visible that hint where a schoolhouse was once located. 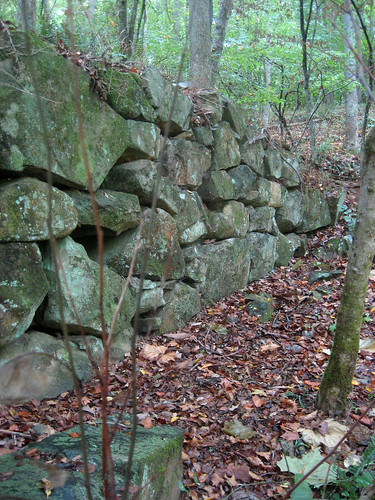 The walls of stacked rock are facinating and stimulate a lot of imagination on how the area must have looked when the mill was active. After finishing the small mill loop, the small common path returns the hiker back to the larger loop to complete the hike. 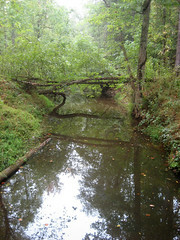 After crossing the bridge, the hiker may wish to complete the Buckquarter Creek Trail.